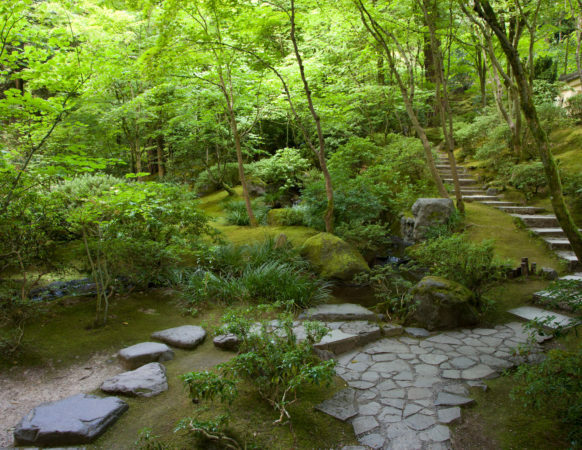 Since its beginnings, the Portland Japanese Garden’s entrance remained relatively invisible at the top of a hill, making it challenging for visitors to find their way. 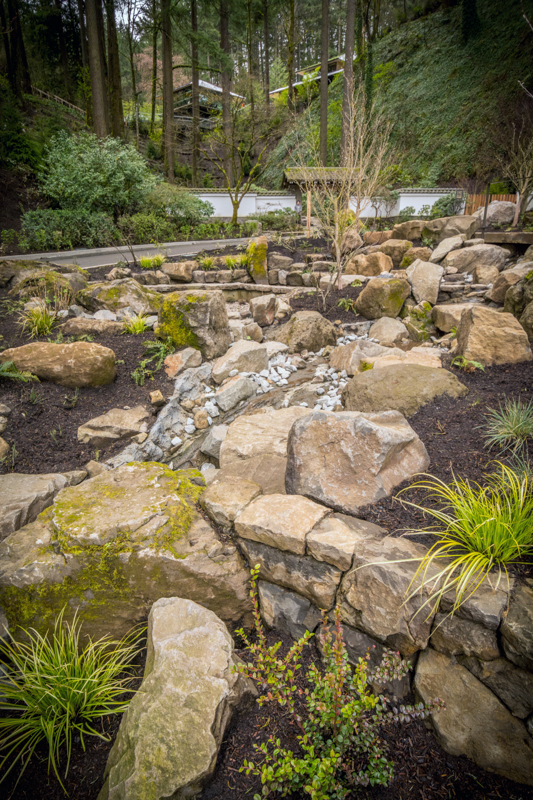 Now, a water garden of cascading ponds welcomes visitors at the bottom of the hill. It is as if visitors were setting foot on land after a voyage across the Pacific from Japan or disembarking from the Willamette or Columbia River, which were the original highways of this region. 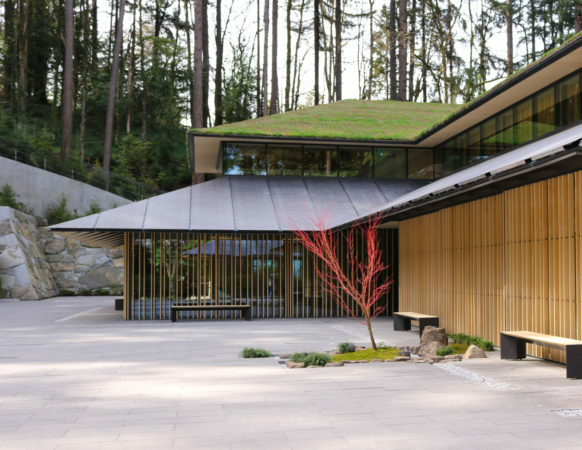 The garden continues along a landscaped walk up a terraced stone pathway and through towering firs and big leaf maples growing naturally along the hillside in a lush native forest. Those familiar with Northwest Native plants might recognize species of trillium, bleeding heart, vanilla leaf, false Solomon seal, and wood strawberry along this path. Small trees and shrubs, like vine maples, salal, and huckleberries frame the view. 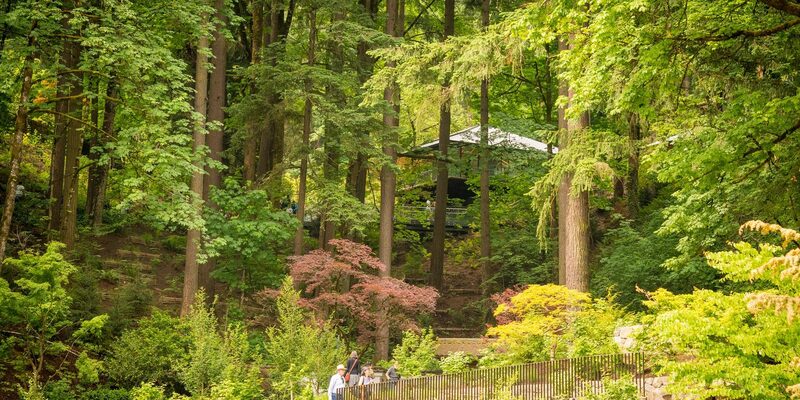 The ancient trees growing from the fern and moss-covered slopes should quiet the mind and refresh the spirit as visitors continue their journey toward the Garden at the top of the hill. Water running down the hill is gathered into an ephemeral creek bed, full in winter and dry during summer.